BATTLE GROUND — An overflow crowd of hundreds crammed into a room at the Lewisville Intermediate Campus on Monday night, and flowed out into the courtyard outside the building. 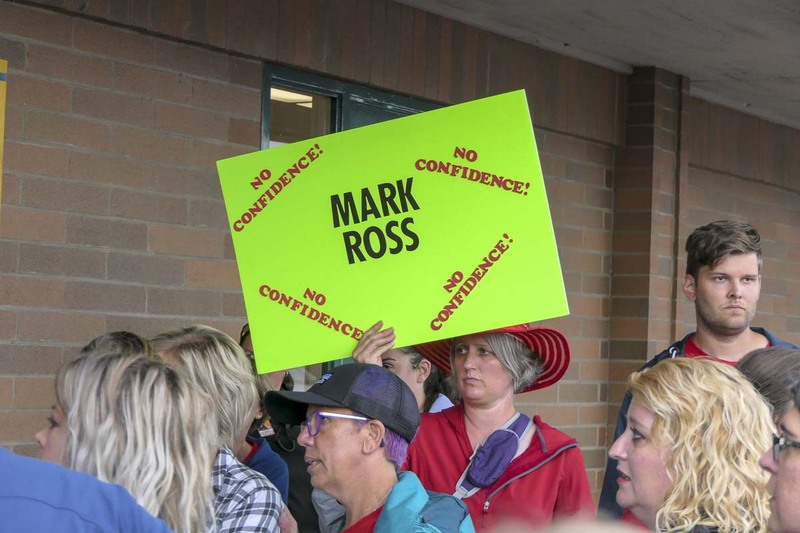 Dozens signed up to spend three minutes largely berating the Battle Ground School District’s Board of Directors for failing to reach a deal with their 800 certificated teachers. But the highlights of the meeting came at the end. The gathered crowd had been warned once to refrain from clapping by board President Ken Root. 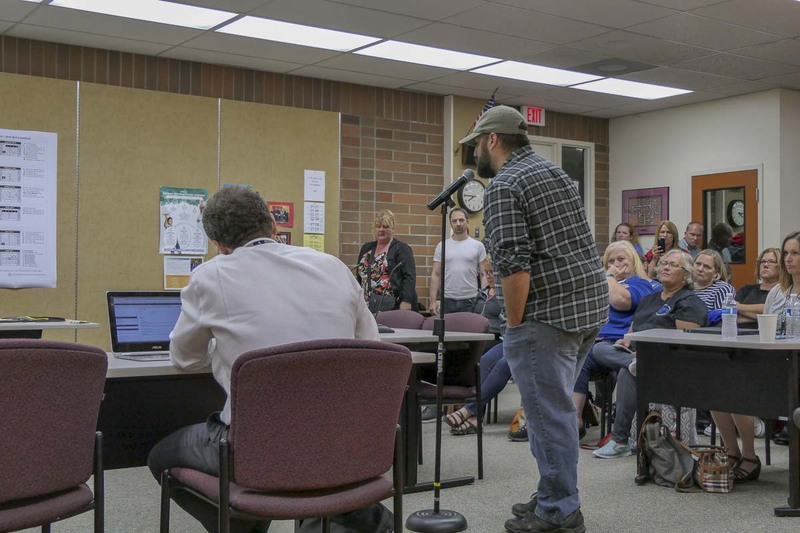 For the most part they obeyed until Washougal Association of Educators President Eric Engebretson finished his own comments urging the board to make a deal like Washougal did. The responding applause forced the board to end the public meeting and resume behind closed doors with only the media present. There the board voted 5-0 in favor of a resolution that will suspend teacher pay if a deal isn’t reached by Sept. 17. Board member Mavis Nickels commented that the resolution wasn’t punitive in nature, but simply compliant with state law that requires public employees be present for their job at least 50 percent of the days in the month in order to qualify for compensation. The district will be allowing teachers to keep their healthcare coverage by essentially covering their premiums until they return to work. It should be noted teachers will not actually lose any pay should they not return to work next Monday, it would simply be delayed until after they return to work. By state law children are still required to have 180 days of instruction, so teachers will still receive their full pay for the year. What that pay ends up being was, for the most part, the topic of a lengthy public comment session prior to the meeting being moved behind closed doors. 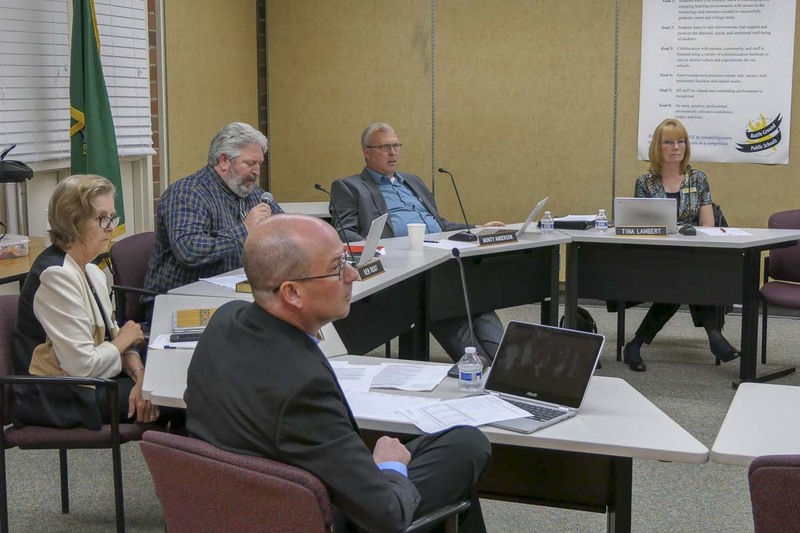 Before the public had their say, Superintendent Mark Ross read a prepared statement, in which he outlined how the district is spending the $9.6 million the state sent for increasing teacher pay. Ross says the state is giving them enough money to pay each teacher $69,129, but that only covers funded staff. The district has long used local funding to pay for additional educators and certificated staff, as well as compensating teachers above what the state provides. “Our current proposal provides an average total compensation of $74,338 in 2018-19 for all teaching staff, not just those funded by the state, and does not include the cost of benefits that the district must pay,” said Ross, adding that their proposal amounts to an average raise of 11.6 percent, which they believe is in line with where other districts in Clark County have settled. The district says the Battle Ground Education Association (BGEA) is seeking a 19.6 percent increase. “We believe this is not a sustainable request,” said Ross. BGEA representatives and the district’s bargaining team will meet today in Olympia with the executive director of the Public Employee Relations Council (PERC). The district has also applied for what is known as Fact Finding, in which an independent representative from PERC will examine arguments from both sides and create a report. 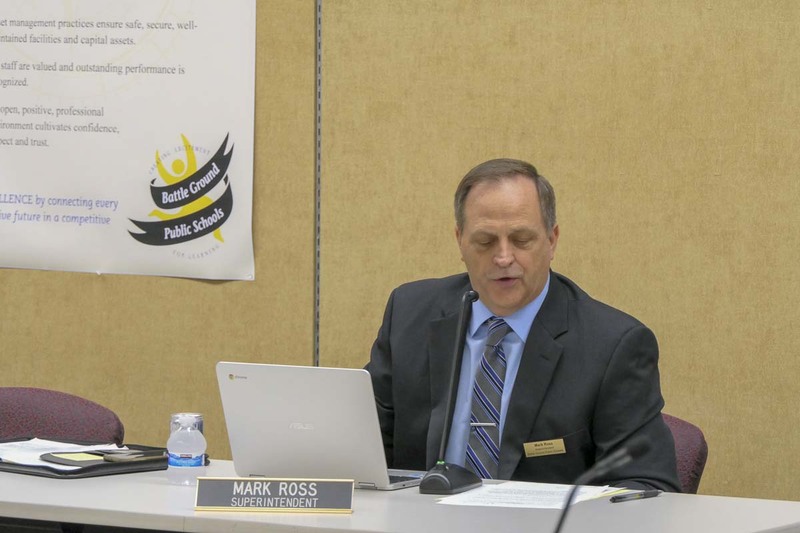 Their opinion is non-binding, but Ross says it is their hope that having that report will help settle the debate over whether the district is, in fact, spending all of the money the state sent them on teacher salaries. Both sides are expected to meet with the Fact Finding representative either Wednesday or Thursday, but will continue mediation in the meantime. It could take up to five days after that meeting before an opinion is issued. 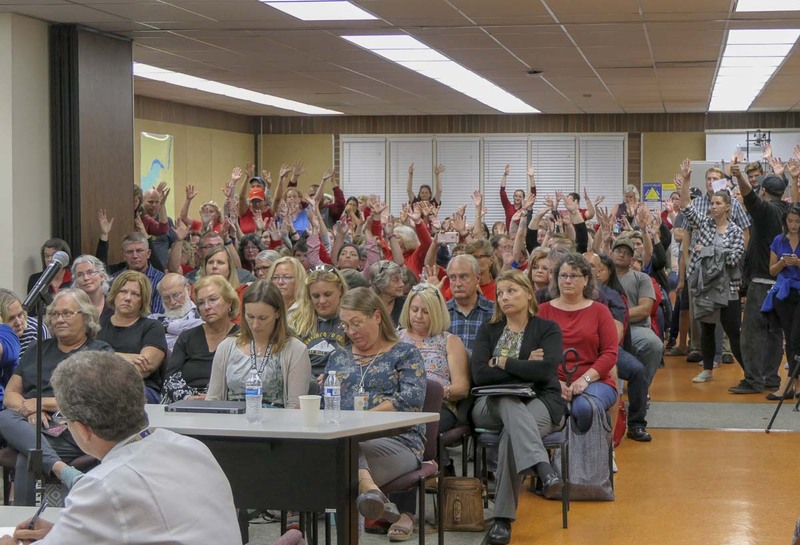 With few exceptions, the nearly four dozen people who got up to address the board spoke in favor of the teachers, in some cases with tears or angry jabs of a finger. Moreno’s comments echoed a number of citizens and teachers who accused the district of shuffling funds from the state to either cover other expenses, or else pad a rainy day fund. Tiffany Couch, a certified forensic accountant who once specialized in educational audits said she took a deep dive into the district’s 2018-2019 projected budget and did find that significant new money was being given to educators, but there were also some things to raise questions. She says her accounting found more than $9 million in new funding that didn’t make it to teachers. Couch says that represents an additional 34 percent spending for supplies and materials, and 73 percent more for purchased services over what was in last year’s budget. The board and Superintendent Ross declined to respond to Couch, and one other commenter who brought up the $10 million, but said they would get back to them via email. ClarkCountyToday.com has also requested additional clarification on these budget items. 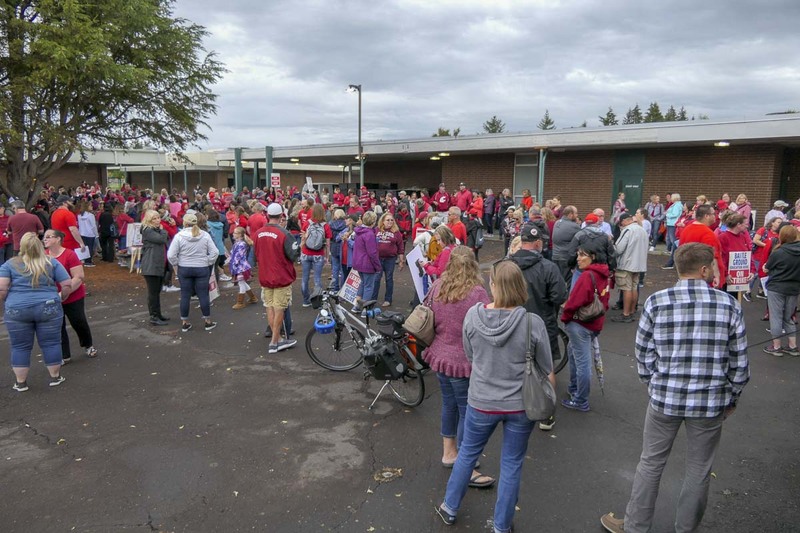 Another common theme was the fear of losing Battle Ground teachers to other districts if they continue to earn less than their colleagues elsewhere in southwest Washington. 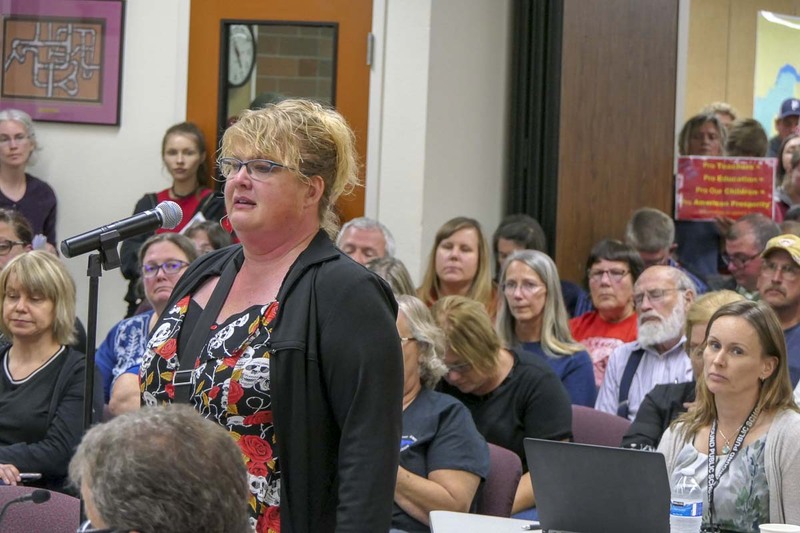 Heather Williams, a science teacher in the Battle Ground school district fought back tears as she showed board members a list of 106 local businesses who had spoken out in support of teachers. The board didn’t respond, but behind closed doors Mavis Nickels could be heard biting back at the idea that the district’s offer leaves Battle Ground teachers as the lowest paid in the county. Before, and sometimes during the meeting, the gathered crowd outside could be heard cheering loudly. Usually it was to recognize support from another local union, such as the Longshoremen. ILWU Local 4 President Cager Clabaugh, a Battle Ground High School graduate, also stepped up to address the board, wearing a sweater that said “Union Thug” on the back. “Alright, you’re smoke and mirrors. I know your answer, thank you,” responded Lemire. Teacher pay wasn’t the only thing the board took heat for. Several people noted the small room that left dozens of people standing or sitting on the floor, as well as a sound system that barely worked, wondering why the board didn’t move the meeting to a larger venue since they clearly knew the level of public interest. Teachers didn’t escape the night without at least some criticism. Mike Reeves said he supports teachers, but only as long as the amount is sustainable. After the meeting, Board President Ken Root said he understands where the community is coming from, as well as the teachers. “I took it to heart,” Root said, as a district communications person tugged at his elbow. The district has already canceled classes through Wednesday, as negotiations continue.